A design plan for Charlesgate Park. Call it Charlesgate Greenway. Actually, Frederick Law Olmsted, the godfather of landscape architecture and creator of Boston’s historic Emerald Necklace, had a more formal name: The Beacon Entrance to the Back Bay Fens. The first park project that Olmsted designed in Boston in the 1880s, it conjured up a grand vision of a gateway that would connect the Charles River to the Fens to Jamaica Pond to Franklin Park in Roxbury. But Olmsted probably never fully anticipated the depredations that the 20th-century cult of the automobile would bring. Over time, portions of the Muddy River were diverted underground to make way for pavement, and more pavement, leading to devastating floods and a gag-inducing tangle of algae, duckweed, and trash floating on the water’s surface. The Bowker Overpass, built in the 1960s, carries some 55,000 vehicles a day overhead, part of a Gordian knot of roadways and ramps that cuts off easy access to leisurely strolls along the Esplanade. Pipes carrying an infernal chemical soup of runoff from the Bowker empty directly into the Muddy. Architects Marie Law Adams and Dan Adams of the Landing Studio in Somerville, who have developed an enticing set of plans for the area, liken it to urban acupuncture — carefully coordinated adjustments that can tie the landscape beneath the overpass together and, at the same time, restore plant life that will naturally filter the runoff fouling the Muddy River. 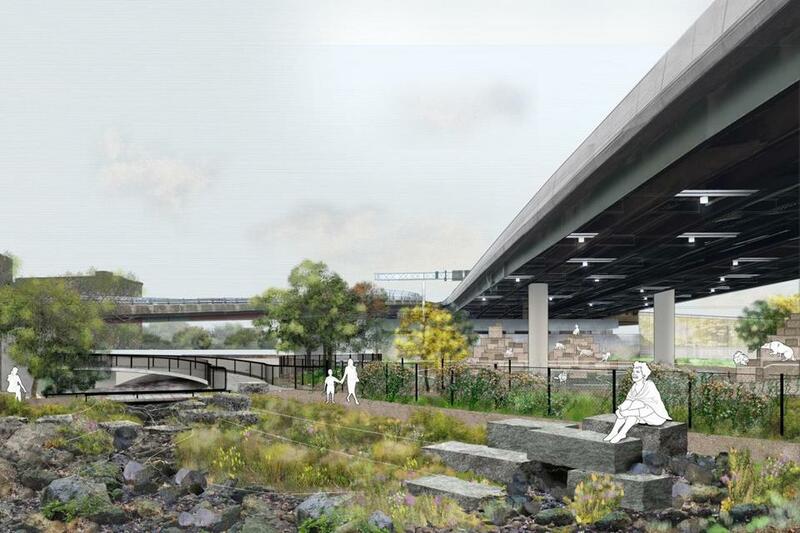 “This is not just a park project, this is a transportation project and environmental restoration project,” says Herbert Nolan, executive director of the Solomon Foundation and a force behind a number of park and greenway restoration projects. 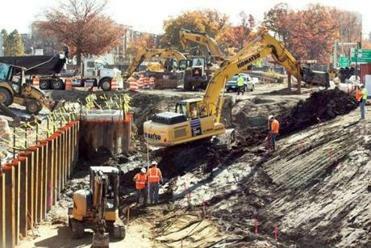 The US Army Corps of Engineers work will “daylight” 700 feet of the river near Brookline Avenue. Landing Studio has already designed a splendid proof-of-concept in another part of the city: Infra-Space 1, a statewide initiative with the Massachusetts Department of Transportation that runs under I-93, behind the Ink Block development. Once a black hole, this well-lit under-highway space is now home to movie nights and a landscape of boulders, grasses, and trees. The greenery diverts runoff from the highway viaduct, which once poured directly into Fort Point Channel, according to the Adamses. One complicating factor for the Charlesgate area: an alphabet-worth of agencies with intersecting roles. MassDOT owns the Bowker Overpass structure, but the state Department of Conservation and Recreation owns the land around it, even directly underneath. Fortunately, the robust level of cooperation so far augurs well for the future: MassDOT agreed to help fund the design and construction of a path connecting the neighborhood to the Esplanade, to the tune of more than $1.3 million, according to a spokeswoman. The Legislature successfully preserved an earmark in the session just ended. And the Charlesgate Alliance, a neighborhood group cofounded last year by H. Parker James and Pam Beale, has also stepped up with a welcoming YIMBY attitude. Recent signs of life include red plastic Adirondack chairs set up in a leafy area by the Muddy, thanks to a grant from the Solomon Foundation. A dog park is also envisioned. “It’s an Olmsted park, and as troubled and damaged as it is, the Olmsted-ness comes through,” says James. And what about the unlovely Bowker Overpass itself? A study three years ago conducted by MassDOT with input from scores of neighborhood groups and agencies recommended against taking down the overpass because traffic would snarl surface roads, cutting off Back Bay from Kenmore Square. “We need to make this a celebrated space again,” says Karen Mauney-Brodek, president of the nonprofit Emerald Necklace Conservancy. With new life stirring and textbook collaboration, Charlesgate is certainly off to a good start.